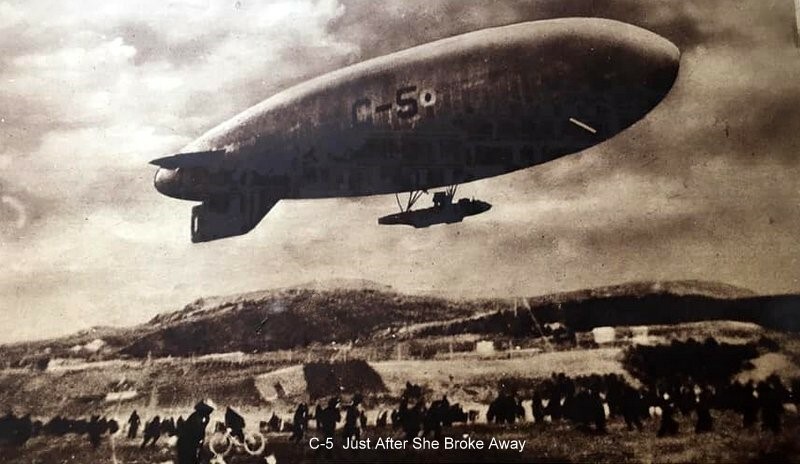 Big Dirigible Nearly Wrecked in Dive of 400 Feet. STOOD SEVEREST OF TESTS Commander Coll Reports. Total Duration of Flight 25 Hours 50 Minutes. The C-5 left New York at 8 AM May 14th 1919 and landed at St. John's Newfoundland 25 hrs 50 minutes after takeoff. Which was 10 minutes to 10 A.M. on the 15th May 1919. Her mission was to join the Transatlantic Air Race. The captain was Lieutenant-Commander Emory Coil, and the crew were co-pilots Lieutenant John Lawrence and Ensign David Campbell, Lieutenant Marcus Easterley, and chief machinist mates T.L. Moorman and H.S. Blackburn. 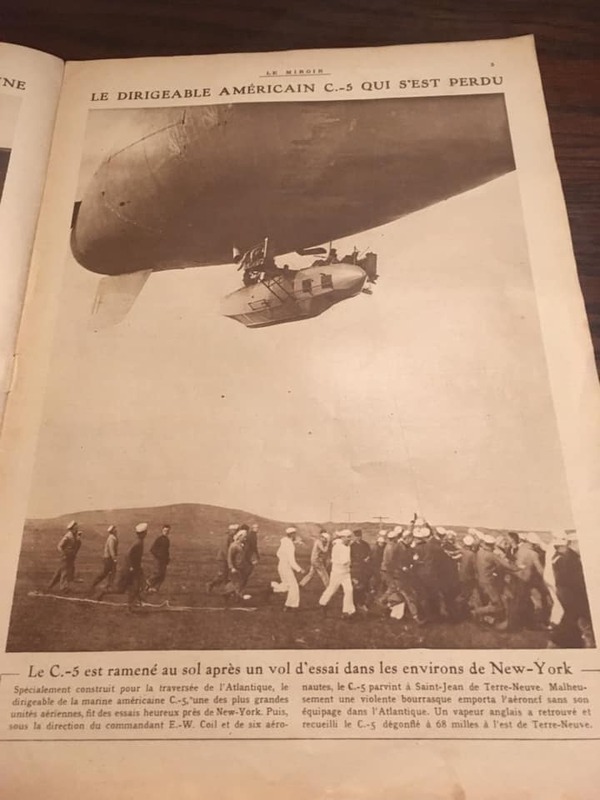 Officially, the flight was to a testing of the practical radius of this type of airship, but the press didn’t believe that. Coil told newsmen, just before takeoff, “We’ll beat the seaplanes yet”. Learn more about this exciting expedition which occurred 100 years ago this year of 2019.
passing Quidi Vidi Lake and landing at a cricket field in Pleasantville, on the north side of the Lake. They experienced some Newfoundland fog as they arrived on the island, lost their bearings, and had to drift low at Placentia Junction to ask surprised locals directions. Ike hadn't gone more than a mile when he came upon the strangest scene. Hovering a few feet above the ground was an enormous blue cigar shaped dirigible surrounded by a throng of people holding onto ropes attached to the strange craft. The people holding fast to the ropes were civilians and sailors alike. They seem to be having a lot of trouble at this moment; steadying the craft in the breeze that had suddenly sprung up. The wind was increasing in intensity and Ike could see that the craft is now pulling on the ropes so hard that it is lifting the restrainers off their feet and dragging them over the ground farther and farther from the anchoring post. "Hey you! You with the horse! Come over here and lend a hand with this rope”. Ordered a man who appeared to be in charge of the ground crew. “We want to attach this rope to your horse~~we have to try to drag this thing back to its anchor. Sailor! Get some rope and splice up a collar for that horse, so we can attach this rope.” “Hurry up with that collar we are losing ground all the time. We have to drag her back to that mooring post and lash her down before another gust carries her off with all us hanging on to these ropes." As the busy sailor puts the finishing touches on the makeshift rope collar he hands it to Ike. Who then slips it over Starr's head and manoeuvres it into place at the horse’s shoulder. It's not a perfect fit but, good enough for this job. A line from the airship is given to Ike and he carefully slips it through the halyard that the seaman had attached to the collar and ties it off with a horseman's quick release knot for safety, just in case this job doesn't work. Ike slowly walks Starr forward: to take up the slack in the line, urging him forward with gentle pats on the rump. Keeping an eye to the tow rope, Ike sees the slack disappear and the rope became taught. Starr's carriage pulling experience comes into play as he leans into the load and ever so slowly the airship is slowly dragged inch by inch back to the temporary anchor that the ground crew has just finished constructing. As the hawser is fastened to the anchor pylon, a cheer goes up from the ground crew and volunteers who had up to now, been locked into a losing battle with the stiff breeze that had been blowing since noon. A middle aged man in navy work dress approaches Ike as he is removing the makeshift harness and patting the neck of Starr. "What's your name son?" "Ike sir!" Came the reply. "Well I have to say! The US Navy is much obliged to you and your horse. We were in a bad way until you came along. We have more men from the Chicago joining us later to help steady our craft but for now everything is under control. I want to present you with this souvenir and an invitation to dine on our ship while we are in port as a token of our appreciation." With the little speech out of the way. Commander of the ground crew Lieutenant C. G. Little presented Ike with a small brass medal, showing a likeness of the blimp inscribed on the front and his name and rank embossed on the back side. Ike hung around for about half an hour looking around and asking the ground crew guys lots of questions. "What are those people over there doing with the tanks and hoses? What makes it go?" Inquired Ike, as he gazed in wonder at the activity going on all around him. "Those guys are filling the fuel tanks and gassing the bags so it will lift when they are ready to takeoff. It has two big gasoline engines to drive it forward, I think someone said that they were more than 120 horsepower each if I am not mistaken." replied the lieutenant. "Why is she wagging back and forth and pitching up and down that way? Does it always do that?" "No this is most unusual. We usually have a tall mast to secure it to, but there is nothing around here like that, so we have to do the servicing from the ground." "Where are they going when they leave here?" "They are hoping to be the first to fly to England, they want to be the first to make the Atlantic crossing by flying machine." "They must be crazy, that thing could never make a trip like that. Ike stood holding Starr and studied the scene. The C-5 was the largest flying object he had ever seen. She was cigar shaped, blue in color and looked to be at least 200 feet in length with a control car slung underneath for the crew. There is a fin located at the rear, A vertical lower fin with a forward fixed section and a hinged section trailing rearward, presumably to steer the craft. Similarly there were horizontal surfaces protruding from each side at the stern with fixed and moving sections also. Ike speculated that this must be for controlling the craft, causing it to rise or descend according to whichever way they were moved. Attached to the control car were two pod shaped objects, one on either side with propellers pointing aft. Ike reflected upon what the crewman had just told him about the gasoline engines and things started to make sense. “Of course, now I understand” he remarked to a boy who had happened to be standing next to him. Understand what?” Said the boy. “Oh nothing! I was just thinking out loud, of how this thing works, that's all.” Muttered Ike, half under his breath. The giant craft being moored so close to the ground was being buffeted by the turbulent winds at the surface: she was beginning gyrate noticeably and she was tugging at the bowline, as she swayed from side to side and pitched up and down; causing the lines to rhythmically slacken and then go taught again. Ike begins to noticed that as time passes the intensity of these gyrations increased. A thought began to form in his mind as the crew boss wanders by with his arms folded across his chest and a concerned look on his face. The boss spies Ike and remarks. “Still here I see. What do you think Ike?" Well sir! I was wonder where the aircrew are and why they are not in the craft controlling her with the engines and rudders. "Frankly Ike, I think they are hoping she blows away, so they won't have to attempt this foolhardy flight. They hightailed it away as soon as they landed and said that she's on the ground, she is your problem now. Frankly I don't blame them; I wouldn't want to be going with them tonight. I heard from one of the crew that they almost lost her on the flight down here. She was diving straight at the ground on a couple of occasions when they managed to pull her out of the dive seconds before hitting the ground. They only managed to survive the trip in from Placentia by following the railway tracks. They found it was impossible to follow a compass course because of the wind. That was last night and I would say that the wind is ten time worse right now." Just then shouts and screams are heard. The lieutenant and Ike spin around to see what is going on at the bowline. Some of the sailors from the Chicago and civilians: those of the party assigned to hold the bow are dangling with their feet 10 to 12 feet off the ground. At this moment someone yells. “JUMP!” Then one by one the crew members begin letting go of the rope and fall back to earth. With the loss of weight on the bowline, the craft suddenly gains altitude at an ever increasing rate. Spectators let out a collective gasp as the craft continues its rise with a lone lineman is still hanging on but he too, realizes it's now or never. Now at twenty feet or so high, he finally relinquishes his grip and falls feet first back to earth. It was then that the perverse Newfoundland weather served up a sudden afternoon storm with high winds striking the field where the C-5 was tied down at her moorings. Lines began snapping and, before the blimp could be deflated, she was torn loose, as men leap from the power car. Now unmanned, she bobbed in the wind as she continued to climb and drift out over the hills eastward towards the sea. Eventually she vanished from view as she drifted far out to sea. The C-5 broke free of her moorings at 14:50 local time and swiftly rises and is last seen disappearing over the hills surrounding Kitty Vitty Gut (5). I was never able to confirm that the above newspaper clipping was accurate or not. If anyone with some thing to add on this we would be grateful if you would leave a comment to this page. 2019 NorthWest Scale Modelers Show - I can't wait!